The Ithaca 610 has been discontinued. No direct replacement is available. Thermal, 203 dpi, 6 inches/second, 802.11b Wireless interface, auto-cutter and US power supply. Color: Dark gray. Order cables separately. See accessories. Thermal, 203 dpi, 6 inches/second, USB interface, auto-cutter and US power supply. Color: Dark gray. Order cables separately. See accessories. Thermal, 203 dpi, 6 inches/second, 25-pin Serial interface, auto-cutter and US power supply. Color: Dark gray. Order cables separately. See accessories. 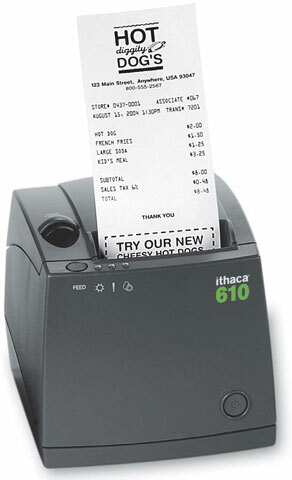 Thermal, 203 dpi, 6 inches/second, parallel 36-pin interface, auto-cutter, cash. Color: Dark gray. Thermal, 203 dpi, 6 inches/second, 36-pin Parallel interface, auto-cutter and US power supply. Color: Dark gray. Order cables separately. See accessories. Thermal, 203 dpi, 6 inches/second, Ethernet interface, auto-cutter and US power supply. Color: Dark gray. Order cables separately. See accessories.